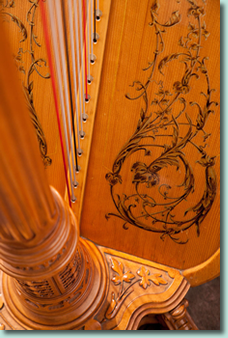 Above is intricate sound board design on Roxanne's Lyon & Healy 23 Concert Grand Harp. 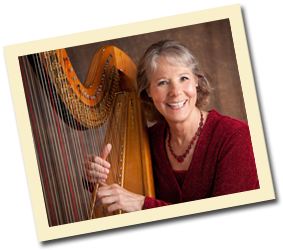 Roxanne Ziegler plays a variety of harps and has used all of them in weddings, events, concerts and recordings. She has a small, battery-powered amplifier to enhance sound for outdoor events. She transports her instruments to each engagement. The queen of all instruments. Most appropriate for large indoor functions such as weddings at churches and party facilities. The intricate carving and sound board designs have been used for well over 100 years, giving this instrument a Victorian look. This has the same big sound as the concert grand harp above. It has a contemporary design with the bold, fluted column. Note the beautiful engraved brass plate shown in the photo below. Purchased especially for outdoor weddings and intimate home gatherings. 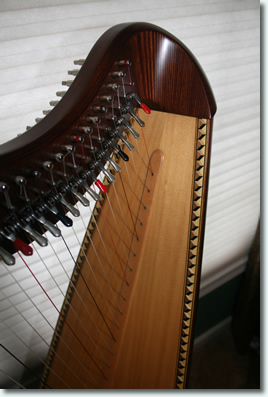 Reminiscent of smaller classical harps from the late 19th century. 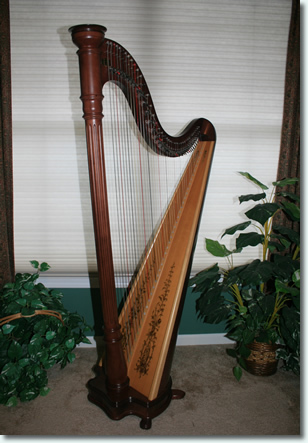 This harp has a big, warm tone, is lovely to look at, and is very portable. 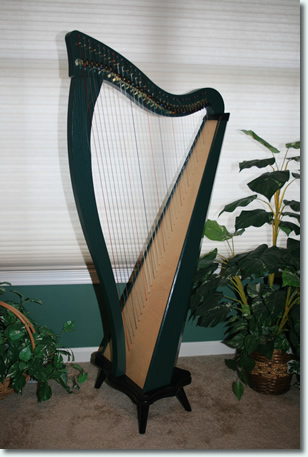 This harp has the perfect look and sound for all those Scottish- and Irish-themed events. 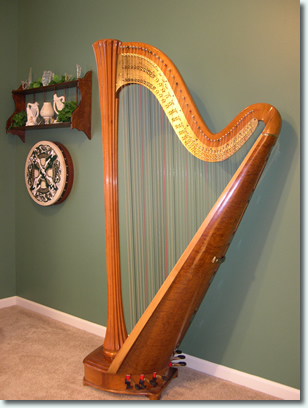 Roxanne also uses this harp in medical settings. Patients, residents, staff and visitors are delighted when she enters with this harp. They are soothed by its beautiful tranquil sound. 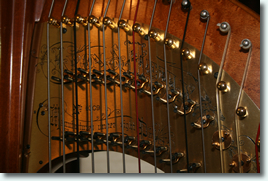 At left is a close-up of details of the Salvi Egan harp. 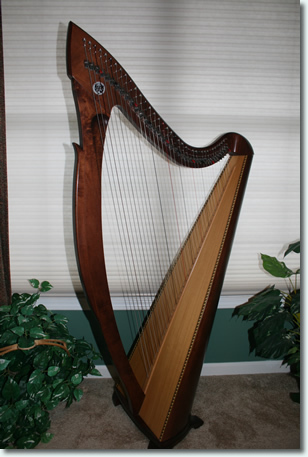 This is the newest addition to Roxanne's harp collection. It has travelled with her to Monhegan ME, Washington DC, Litchfield CT, Burlington VT, and the Finger Lakes region of New York for many delightful getaways. This harp comes along with her bike, kayak, and kitties for a great vacation. Working with Roxanne is a great choicesimple, easy, and rewarding. Contact Roxanne Ziegler, your wedding and event harpist, about your music needs today! 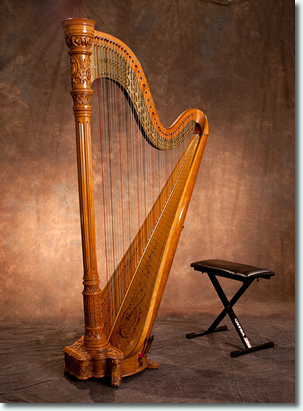 Roxanne Ziegler is a professional harpist providing harp music for any occasion. She brings elegance, comfort, atmosphere, and meaning to wedding services and receptions, special events, harp presentations, corporate functions, private celebrations, nursing homes, hospitals, and hospices. She appears as a harp soloist or in distinctive ensembles with flute, violin, voice, or hammered dulcimer.